The focus and attempt to create a gender-progressive Budget this fiscal year is indeed welcome. However, reading through the Budget proposals, it is alarming to see how many of its allocations to address women’s issues tend to further discriminate against women, or are very likely to endanger women, and the rights we have been fighting for, in the long-term. Many of the perceived ‘progressive’ ideas that have been listed to help women have been lauded in the media. Some have gone so far as to call this Budget a women-friendly one, and at first glance there certainly appear to be positive developments. Dig deeper, though, and you will find that these budgetary allocations and policies, such as flexible working hours, crèches (day-care centres), loan schemes and more have not been carefully considered and in turn allow for further discrimination against women, possibly creating space for the abuse of young children as well. The language used in the Budget proposal is indicative of more of a concern for the growth of the economy than the empowerment of women. Point 48, for example, states “The limited participation of women in the workforce is a clearly identified growth constraint.” Therefore, to boost the growth of the economy, it is proposed that the private sector is ‘encouraged’ to pay 50% of women’s salaries during their three month mandatory maternity leave. As reward for this, corporate taxation will be deducted by a maximum of Rs. 20,000 (minimum pay) for each employee on maternity leave each month. On the fourth month, 100% of their pay will be deducted from the company’s taxation. It is added that these terms will apply for a five year period. What does all of this mean? Firstly, it undermines existing labour law for maternity leave. Mandatory maternity leave and pay schemes are already established by law and employers are required to follow it. Encouraging companies to do something they already should be doing by plying them with tax deductions seems completely unnecessary. What is likely to happen in turn, is that most companies will get comfortable with the idea of tax deductions for providing women their rightful maternity leave. If and when a new government decides to abandon this scheme, companies will feel entitled and more reluctant to hire women or give them their legally entitled maternity leave and compensation, as they have lost an unnecessary incentive. The tax deductions scheme therefore creates an unhealthy precedent. These incentives are expected to make hiring newly-wedded or pregnant women desirable to private companies, as they are often avoided by private employers. While this is a very real problem, this discrimination is a structural issue that needs to be addressed directly, by establishing effective long-term solutions. The proposed superficial incentives will erode the existing law for maternity leave, and we as citizens will be paying for this regression in both women’s rights and our tax rupees via these State-funded incentives. While maternity leave is mandatory by law, paternity leave is not. If this budget truly were gender-progressive, it would have focused more on providing well-planned incentives for paternity leave. Instead, those who wrote this budget clearly believe that women are the sole caregivers in a family, placing the burden of reproductive labour heavily on the shoulders of the mothers. Paternity leave could bring about immense structural and long-term positive effects on our society. It would help chip away at patriarchal beliefs about women as sole caregivers; it would help men be more involved in the upbringing of their children and thereby strengthen family bonds; and it would allow women to have more free-time and in turn reduce issues such as postpartum depression. Instead, the Budget’s focus on engendering companies’ entitlement to tax concessions and changing labour laws to include nocuous flexible working hours for women, precludes any real attempt to ease the burden on working women. This should clear any doubt about the disingenuousness of this so-called ‘pro-women’ Budget. According to the Budget, maternity leave is not enough to ensure that women continue to be part of the workforce and boost economic growth. Once an infant grows into a toddler, they would still require a great deal of care, and so the newly-proposed Budget encourages the establishment of ‘child-care facilities’ by the private sector, via the “Rekawarana” Concessionary Loan Schemes of “Enterprise Sri Lanka”. The wording with regard to this budgetary allocation is very vague. It is unclear if ‘private sector’ here refers existing companies providing day-care, or whether the concessionary loan schemes will be provided to individuals to start their own privately-run day-care centres. In either of these cases, monitoring of these day-care centres would be imperative. It should not be that only after a reported incident of child abuse or molestation will a day-care centre be investigated; regular and even unannounced checks can ensure that such children in childcare centre are safe and well looked after. It is stated in the Budget proposal that the Ministry of Women and Child Affairs will “issue necessary guidelines and the regulations for establishment and operation of child-care centres, after-school & vacation-care centres, and similar facilities”, with no mention of monitoring. Therefore, only once an incident is reported can legal action be taken. In many cases, children do not talk about the abuse they experience, and continue to suffer in silence. Cases of abuse in orphanages, boarding schools and schools are endemic in Sri Lanka, but these are rarely handled with sensitivity towards the child victims. We need to improve our existing child protection systems before we even begin to discuss childcare centres, and then too we need to be proactive and ensure mechanisms are in place to prevent abuse, so no child will be subject to such trauma. If this scheme is to be implemented, the Government must provide the Ministry of Women’s and Child Affairs funding to establish a unit to monitor all the child-care facilities mentioned in the budget. However, feasibility comes into question if there are too many to monitor. 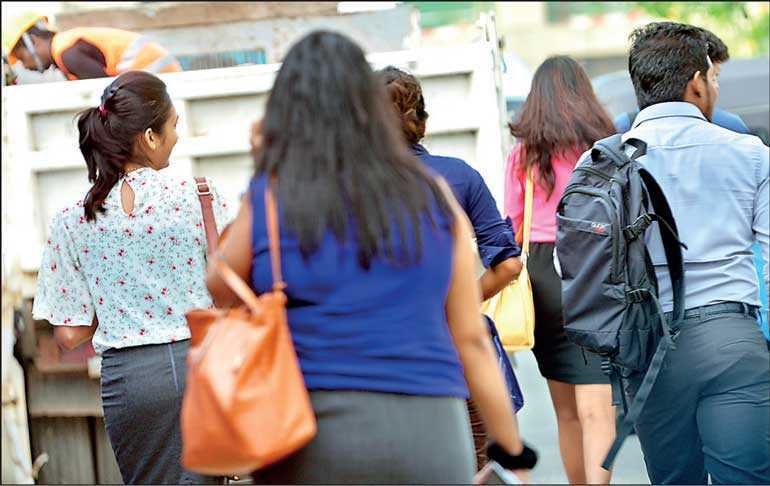 In another attempt to ensure women are hired in order to augment the economy, the proposed Budget calls for amendments to labour laws to allow for part-time, flexi-hours, and home-working. On the face of it, it would appear to be a relief for many working women. Perhaps women would not have to utilise those potentially unsafe day-care centres, for instance, if they are able to work from home and care for their child at the same time. But that is precisely the double-burden working women have to endure. Our society is such that the burden of caring for your children, attending to household chores, and other unpaid labour is the sole responsibility of women. Instead of ensuring that men take on their share of this burden, workplaces will provide flexible work hours, so the women can utilise any or all the free time they can find to work on jobs where they can make an earning. This will leave women overworked and exhausted. The double-burden aside, there are other ways women with flexible work hours are exploited by companies that employ them. For instance, in most part-time, consultant and flexi-hour contracts, EPF and ETF and health insurance can be, and are, easily excluded. A part-time worker lacks the agency to bargain for regular staff benefits, and would find it difficult to organise with other part-time workers. Amending labour laws to include part-time and flexible working hours would have to be extremely detailed to ensure women are not exploited in the workplace, but as mentioned above, it still saddles women with the double-burden. What is most afflictive about this budget is its deceptive exploitation of women. It is packaged as progressive and pro-women, but get past the bells and whistles, and you will find that it creates space for women to work during their every waking hour; it makes no attempt to remove or abate some of their existing burdens. Small measures that can make a difference to women, such as introducing paternity leave, are not even considered in this deeply problematic Budget proposal. What we have been presented with are superficial attempts to empower women, which will undoubtedly do more harm than good. To effect real change, we need structural changes. The benefits of such changes may only manifest perhaps some years later, but these will be far more effective in changing cultural attitudes and granting women a better place in society for generations to come.